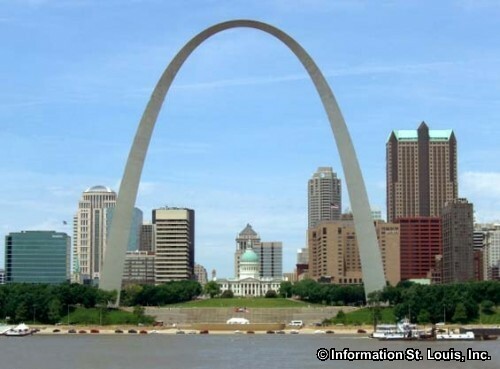 The City of St. Louis Missouri is located along the banks of the Mississippi River. The city radiates north, west, and south from Downtown St. Louis. The eastern boundary is the Mississippi River and extends northward to the Old Chain of Rocks Bridge and Interstate 270 as well as southward to where the River Des Peres empties into the Mississippi River. The western boundary of the City of St. Louis follows along an imaginary line that forms somewhat of a semi-circle around the city with the western most point being just west of Forest Park. Four major Interstates enter Missouri at St. Louis and run east and west crossing the Popular Street Bridge and fanning out westward through the city like spokes on a wheel. Those Interstates are I-55, I-44, I-64 and I-70. Other important roads to the city are Broadway, Tucker, Market, Washington, Chippewa, Gravois, Grand, Kingshighway, Chouteau, Jefferson, Hampton, Olive, 4th, Dr. Martin Luther King, Forest Park, Delmar, Natural Bridge, Florissant and many others. When talking about St. Louis, most people think immediately of "downtown" St. Louis. Downtown St. Louis is where the city had its beginnings. It was founded in 1763 by the French fur trader, Pierre Laclede. He came from New Orleans to establish a fur trading post near the confluence of the Mississippi and Missouri Rivers. He named the city after King Louis IX of France and laid out the original plat for the city. That original city plat was located where the Jefferson National Expansion Memorial now lies which includes the Gateway Arch, the Old Cathedral and the Old Courthouse. The Old Cathedral is on the original land allotted by Laclede for a church and is all that is left of that original city plat. Laclede's Landing, located just north of the Ead's Bridge, is all that remains of the original street grid laid out by Laclede. 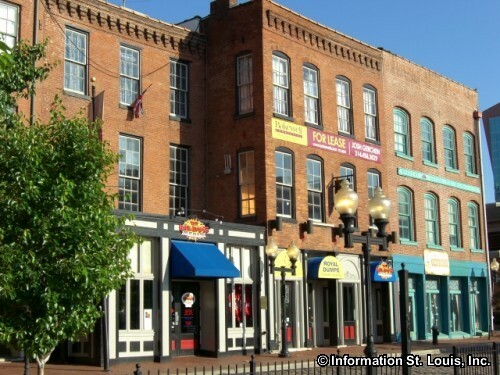 The historic buildings in Laclede's Landing, although not from Laclede's time, were once warehouses and offices for the river boat trade and have been extensively renovated and now house attractions such as the Morgan Street Brewery, the Wax Museum of St. Louis, the Royal Dumpe Dinner Theatre, restaurants and entertainment venues. Laclede's Landing is also home to the Lumiere Place Casino along with the Four Seasons Hotel. Downtown St. Louis offers many things to do and see and is home to many of St. Louis' attractions and historic buildings. The home fields for St. Louis' three professional sports teams are located in Downtown. The Major League Baseball team, the St. Louis Cardinals, play at Busch Stadium. The St. Louis Blues, a National Hockey League team, plays at the Scottrade Center. And the National Football League team, the St. Louis Rams, have their home field at the Edward Jones Dome. The amazing City Museum, where adults have as much fun as children, along with the World Aquarium that is housed within the City Museum, is a "must see" when visiting St. Louis. 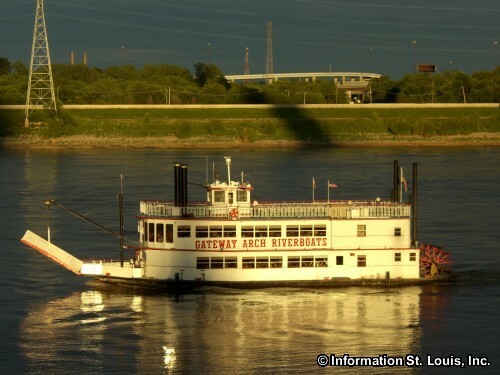 The St. Louis Riverboats feature two 19th-century replica steamboats, the Tom Sawyer and the Becky Thatcher, that take daily cruises on the Mighty Mississippi River. The Citygarden is a green oasis in the city and a nice place for a stroll being filled with large art sculptures, water features, like the 102 water jets of the spray plaza, native Missouri landscaping and a cafe. A slow ride around the city in a horse drawn carriage provided by the St. Louis Carriage Company is a great way to appreciate the views St. Louis has to offer. Many annual events and festivals are held in Downtown St Louis. In July, the biggest birthday party given for our nation is held right here in Downtown St. Louis on the grounds of the Gateway Arch. Fair Saint Louis is held over several days during the Fourth of July holiday and features the Veiled Prophet Parade, live entertainment, the Fair Saint Louis Air Show and of course fireworks each evening of the fair. On the weekend before Veteran's Day, the Veteran's Day Parade is held on Saturday and passes in front of the Soldiers Memorial in an awesome display of patriotism. 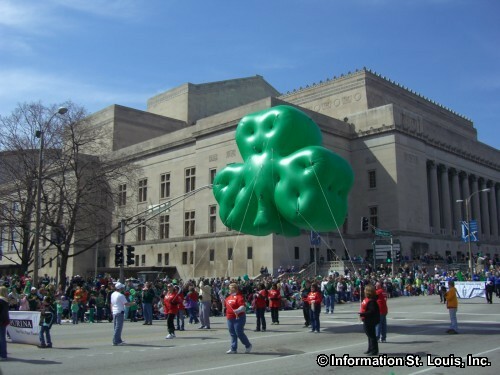 Other parades held in the city are the St. Patrick's Day Parade, the Annie Malone May Day Parade, the Labor Day Parade and the St. Louis Thanksgiving Day Parade. Downtown St. Louis also plays host to the Mardi Gras Fat Tuesday Parade with two other large Mardi Gras parades, the Beggin Barkus Parade and the River City Grand Parade, held in the Soulard Neighborhood. The Mardi Gras celebrations held in St. Louis are one of the biggest in the nation outside of New Orleans! The Taste of St Louis is held in front of St. Louis City Hall and features many of the great St. Louis restaurants and their chefs for a wonderful day of food, art, music and wine tasting! The St. Louis Marathon brings in thousands of runners from around the globe as well as runners from the Metro area, to compete in the races each year. Other races that St. Louis hosts are the St. Patrick's Day Run on the Saturday before the holiday and the Susan G. Komen Race For a Cure. Two special biking events are held in St. Louis. If you like the idea of riding your bike through the streets and parks of St. Louis in the dark beginning at Midnight then the Moonlight Ramble it for you! The Gateway Cup Bike Race brings in pro cyclists from around the world to compete in races held in four of St. Louis' neighborhoods and is held over the Labor Day weekend. History buffs and admirers of fine architecture will love the many buildings and structures that Downtown St. Louis has! One gem of Downtown is Union Station which offers a step back in time when St. Louis was the busiest train destination in the nation with 22 railroad lines coming through the city. Today, the beautifully restored Union Station, built in 1894, although no longer an active train station, but does offers visitors a place to stay, play, eat and shop! Soldiers Memorial Military Museum was built in 1938 to honor the 1,075 St. Louisans that served and lost their lives during World War I, but also houses in its two museums memorabilia from all the wars that our nation has been involved in since WWI. Another structure is the Eads Bridge, completed in 1867, and is an amazing feat of architecture being the first bridge in the nation that used cantilevers during the construction of the superstructure which allowed for uninterrupted river boat traffic on the Mississippi River. 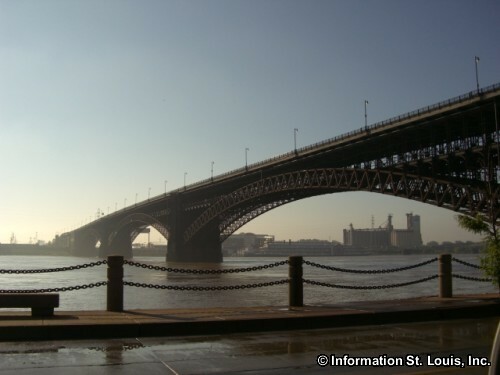 Located on the St. Louis Riverfront, the upper deck of the Eads Bridge is open to pedestrians and cyclists. Several historic homes are still standing Downtown. One is the Eugene Field House and Toy Museum, childhood home of the poet Eugene Field and his father Roswell Field, an important attorney during the Dred Scott case. Another home is the Campbell House Museum, built in 1851, and occupied by a prominent St. Louis businessman, Robert Campbell and his family, until 1938. The house has had a multi-million dollar renovation and showcases the Campbell family's life in St. Louis. Although not in Downtown but located on the campus of Saint Louis University in the Midtown Neighborhood, another example of fine architecture is the Samuel Cupples House which was the family home of the wealthy St. Louis businessman, Samuel Cupples. Washington Avenue is filled with beautifully restored buildings that once held the offices and warehouses of the Garment District but which now house restaurants, lofts, entertainment venues, galleries and more. Washington Avenue is also a shopping and dining destination in Downtown! Other architectural gems in Downtown are the Old Post Office, St. Louis City Hall, the Central Library, the Wainwright Building, the Civil Courts Building, and so many others! Downtown St. Louis might be the most prominent of the city's neighborhoods, but the City of St. Louis is made up of 79 government designated neighborhoods with the Downtown Neighborhood just being one of them. Many of the neighborhoods are made up of communities that formed shortly after St. Louis was founded. The Carondelet Neighborhood is one of those. Carondelet was an independent community, founded in 1767 and was annexed by St Louis in 1870. Within the Carondelet Neighborhood is the historic Carondelet Park and the historic Carondelet-St Louis Public Library Branch which is also a City Landmark. Soulard is another historic St. Louis Neighborhood. Located just south of Downtown, Soulard features Soulard Farmers Market, the oldest farmer's market still in operation in St. Louis today. Also located in Soulard Neighborhood is the Anheuser Busch Brewery, founded in 1852 by the German brewer Eberhard Anheuser and his son-in-law Adolphus Busch. Another neighborhood is Old North St. Louis. Within the neighborhood are two businesses that have been around a very long time. Crown Candy Kitchen is one of them and has been operated by three generations of the Karandzieff family since 1913. Homemade chocolate candies and a wonderful restaurant bring customers back again and again! The second is Marx Hardware & Paint Co. This hardware store has been in business serving the Old North St. Louis Neighborhood since 1875! These businesses are located near the newly revitalized 14th Street area called Crown Square. 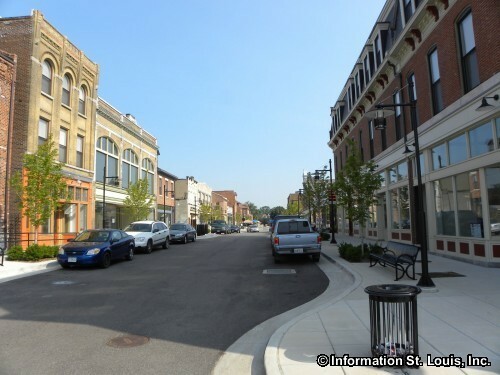 *For a list of all the St. Louis City Neighborhoods, click here. St. Louis is dotted with buildings that have been designated as St. Louis City Landmarks and some of those same buildings are also on the National Register of Historic Places. Three very unique examples of such structures are the historic water towers that rise above the city. Two of them are located in the College Hill Neighborhood, the Bissell Water Tower, or "New Red", that was built in 1886 and close by is the Grand Water Tower, or "Old White", that was built in 1871. 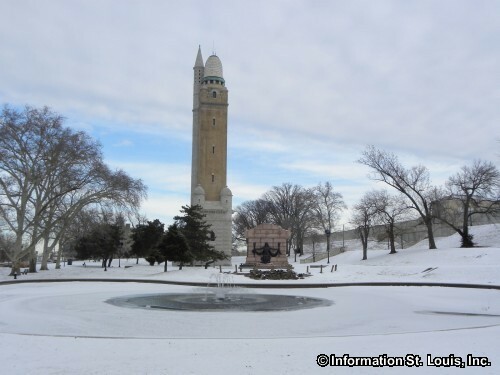 The third tower is located in the Compton Heights Neighborhood in the Compton Hill Reservoir Park and was built in 1898. Named the Compton Hill Water Tower, it is the only one of the three that has been totally restored and can be toured. Two beautifully restored 19th century homes are located in the Benton Park Neighborhood, the Chatillon-DeMenil Mansion and the Lemp Mansion. Both mansions can be toured, with the Lemp Mansion being reportedly haunted and featuring "Paranormal Tours"! The Scott Joplin House is a State Historic Site. Located in the Midtown Neighborhood, it was the home of the famous Ragtime composer, Scott Joplin, in 1900 and today is a museum to his life and music. A very distinctive St. Louis landmark is the Bevo Mill located in the Bevo Mill Neighborhood. Built by August Busch, Sr. in 1917 and located halfway between his home located in what is now Grant's Farm and the Anheuser-Busch Brewery, it served as his private dining room! Today it has been restored and is a fun location for wedding receptions and other special events. 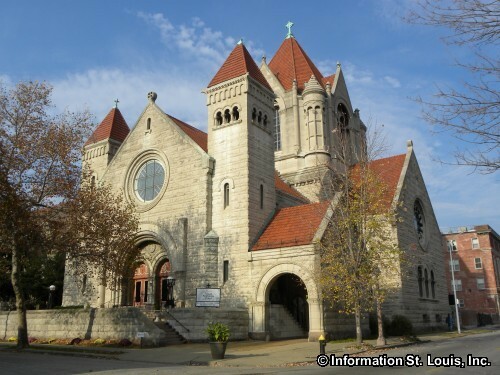 St. Louis is also filled with some wonderful examples of historic churches which are designated as landmarks. The Catholic Church was very important in the early history of the City and built many of these beautiful buildings. 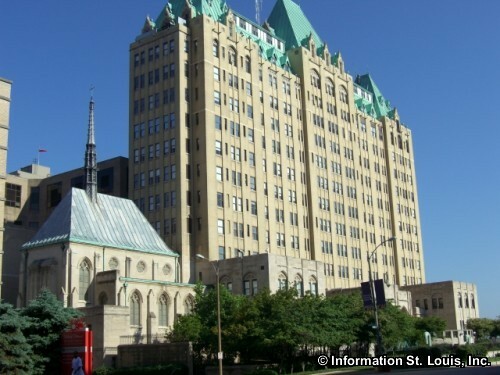 The Cathedral Basilica of Saint Louis, or "New Cathedral" located in the Central West End Neighborhood is one of them. Located in the Downtown West Neighborhood is the Christ Church Cathedral that was built in 1867. The current church building of the Zion Lutheran Church, located in the St. Louis Place Neighborhood, was built in 1895 for the largely German population living in the parish. St. Francis de Sales Oratory is on the National Register of Historic Places as well as being a City Landmark and is located in the Fox Park Neighborhood. Two churches that are landmarks that are located in the Soulard Neighborhood are Saint Vincent DePaul Catholic Church and Saints Peter and Paul Catholic Church. The Shrine of St. Joseph is in the Columbus Square Neighborhood and is the location of the only Vatican authenticated miracle that has occurred in the Midwest. St. Ambrose Catholic Church, founded in 1903, was built in The Hill Neighborhood for the largely Italian immigrant population that was located there. And there are many more! The City of St. Louis is home to many of the Metropolitan area's most popular attractions. Forest Park is the largest of the city's 111 parks and holds a good amount of those attractions. The St. Louis Art Museum, the only building left from the 1904 World's Fair, the St. Louis Zoo, the Muny, the Jewel Box, the seasonal Steinberg Ice Skating Rink, the James S. McDonnell Planetarium which is connected to the St. Louis Science Center via an enclosed walkway across Interstate 64 and the Missouri History Museum are ALL located in Forest Park. 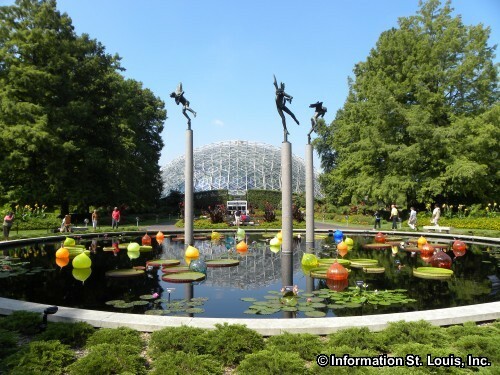 The Missouri Botanical Gardens and Tower Grove Park, both gifts from Henry Shaw to the residents of St. Louis, are truly gems of the city with the Gardens being a scientific research center as well. Located in the Covenant Blu-Grand Center Neighborhood visitors will find the Grand Center Arts District and some of St. Louis premiere performing arts venues and centers. Some of them include the Fox Theatre, the Sheldon Concert Hall, Powell Symphony Hall and the Grandel Theatre. One distinctly St. Louis summertime attraction is Ted Drewes Frozen Custard! With two locations, Ted Drewes on Chippewa in the St. Louis Hills Neighborhood and the other Ted Drewes on South Grand in the Dutchtown Neighborhood, locals and visitors alike find that the famous "concrete" is perfect after a night at the Muny or a Cardinals baseball game! Residents of the City of St. Louis are served by the St. Louis Public School District as well as many private and parochial schools. 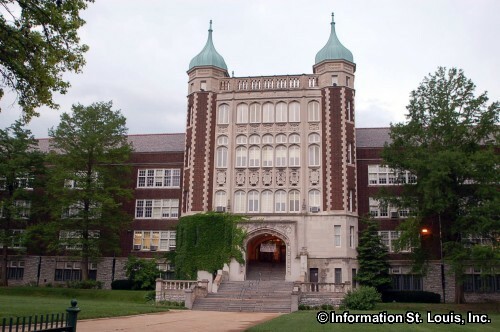 The St. Louis Public School District, founded in 1838, has 65 schools, with eight of them being high schools. Those public high schools are Vashon High School, Roosevelt High School, Sumner High School, Beaumont High School, Gateway High School, Soldan High School, Central High School and Carnahan High School. The Archdiocese of St. Louis operates 23 private Catholic schools within the city. Six of them are high schools and the others are schools that serve students in Kindergarten or Pre-school through 8th grade. Those six private high schools are Cardinal Ritter Prep, St. Elizabeth Academy, Bishop Dubourg High School, Rosati-Kain High School, St. Mary's High School and St. Louis University High School. There are also many other educational options operating in the city such as charter schools or independent public schools. There are six institutions of higher learning located within the St. Louis boundaries. Those include Saint Louis University, Ranken Technical College, St. Louis College of Pharmacy, St. Louis Community College-Forest Park Campus, Harris-Stowe State University and St. Louis College of Health Careers. St. Louisans are fortunate to have premier hospitals located within the city. Two of those hospitals are associated with two metro area universities, Washington University Medical Center and Saint Louis University Hospital. Two others are top medical facilities in the nation and specialize in children medicine, St. Louis Children's Hospital and Cardinal Glennon Children's Medical Center. Barnes-Jewish Hospital is the largest in the city and is the flagship hospital for the BJC Health Care System that is located throughout the region. The US Veteran's Affairs has one of its two VA hospitals that are in the Metro area located in the city. It is the St. Louis VA Medical Center-John Cochran campus. The other VA Medical Center is located at Jefferson Barracks in South St. Louis County.